Burak Cingi/RedfernsAnderson .Paak has officially gifted fans with his new studio album, Ventura. Dialing in at 11 tracks, the Dr. Dre-produced effort features guest appearances from Motown legend Smokey Robinson, Andre 3000, Nate Dogg, Brandy, Jazmine Sullivan, Lalah Hathaway and Sonyae Elise. 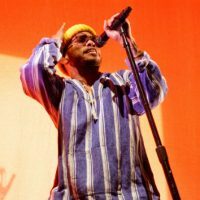 The record is led by the previously released tracks “King James” and “Make It Better.” It arrives just six months after .Paak released Oxnard, in November 2018. Speaking with VIBE early last month, the Grammy-winning star revealed Ventura was influenced by to OutKast and the late Notorious B.I.G. “It’s one of those crazy things where you need some chill stuff, something that’s soothing but also still got that bop to it,” .Paak told the publication. Ventura is now available on all streaming services.